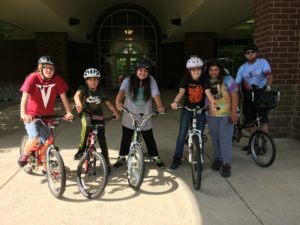 The program has been presented at Tullahoma East Middle and West Middle schools by Jessie Schwer and Joe Capezza with the grateful help of volunteers from the HR Bike Club. The program was initiated several years ago with the intent that deserving middle school students would learn to completely tear down and rebuild a bicycle. The bike, along with a helmet and miscellaneous equipment would be earned by completing the program. This was based on a Nashville program which was conducted by professional bike mechanics in a bike shop. The program also includes safe riding skills. We have since condensed our program to essential repairs and maintenance & cycling skills. Tullahoma Re-Cycle was originally funded with grant money made available by the City of Tullahoma and using bicycles from the Tullahoma police impound lot. That grant has expired and the impound lot is empty. We are applying for a grant from the Jeff Roth Cycling Foundation to continue the program. However, we are in need of bicycles that can be repaired at a reasonable cost, donations (it costs approximately $100 per student – exclusive of the bicycle – to run this program), and volunteers to assist in mentoring students. Our goal is put ten students through the program this year using multiple sessions of not more than 5 students per session. Thanks Joe for submitting the article and for the work you do to help children get bikes. The group pictured above referred to Joe as “Uncle Joe” by the end of the session. (Before the program, some of these girls had to walk 3 miles to school.) What a difference you are making in their lives!